Many forces can act at a point in the same plane and these forces may vary from one point to the other. It may happen that some forces are parallel to each other while the others meet. So, to explain this particular thing it is important to understand the provided diagram here. The figure explains that the different forces F1, F2, F3 and F4. 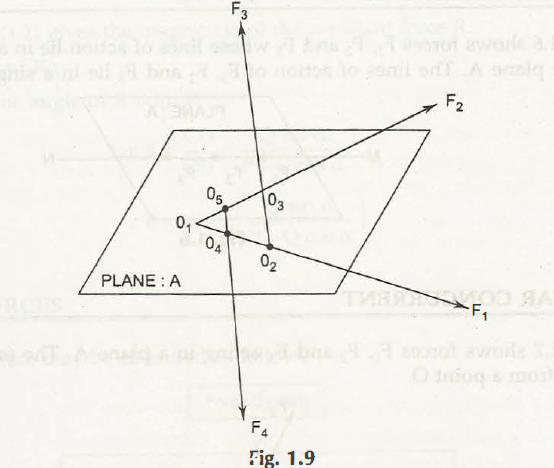 In this figure it is clear that the forces F1 and F2 meet at a point O1. At the same time F3 meets F1 at O2 and F3 meets F2 at O3. Now, come to the force F4 that meets the point at O4 and O5. O4 means the forces F4 intersects the force F1 and O5 indicates that F4 intersects the force F1 at the point O5. All these forces act on the same plane A. The magnitudes and resultant may vary from different points of intersections.